Flexible Wall Permeability Cells - Gilson Co. Flexible Wall Permeability Cells meet ASTM D5084 test standards for laboratory permeability testing and measuring hydraulic conductivity of fine-grained soils and other such materials that have been saturated with water. The cells are equipped with a heavy-wall clear acrylic chamber, anodized aluminum bases and caps, and can be selected with brass or stainless steel fittings. While similar to Triaxial Cells, Flexible Wall Permeability Cells do not have a loading piston. They are designed for use with Gilson Master or Auxiliary Control Panels or other manufacturer’s equipment. 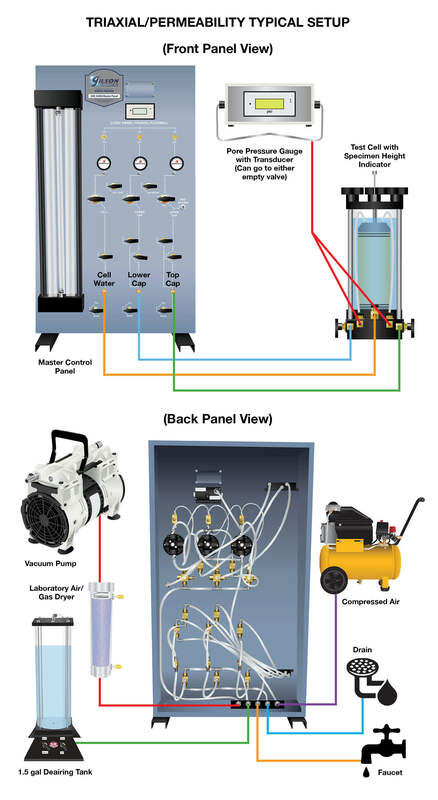 Click here to view a diagram of a typical Triaxial/Permeability set-up showing a Master Control Panel, Test Cell, and other equipment needed to comply with test standards. Permeability Cell models are available to test a range of cylindrical specimens in diameters from 1.4 to 6in (35.6 to 152.4mm) when fitted with the proper Test Cell Kit. Size-specific Test Cell Kits are available separately containing components required for mounting and testing specific sample diameters. Flexible Wall Permeability Cell, 1.4 to 4in dia. Specimens accommodates 1.4, 1.5, 1.87, 2.0, 2.36, 2.42, 2.5, 2.8, 3.0in and 4.0in diameter specimens. The cell has a chamber interior of 4.75x10.75in (121x273mm). Flexible Wall Permeability Cell, 1.4 to 6in dia. Specimens has a 7.5x13.5in (191x343mm) chamber interior. In addition to the range of specimen diameters listed above, this Cell accommodates a 6in (152.4mm) diameter specimen.